Season the short ribs with 2 teaspoons of salt, then cover and refrigerate for at least 1 hour or up to 1 day. Preheat the broiler and position a rack 4 to 6 inches from the heat. On a large rimmed baking sheet, toss the onions and garlic with 1 teaspoon of the oil and season with salt and pepper. Broil for 10 to 12 minutes, until the onions and garlic are charred in spots. Let cool, then discard the garlic skins. Reduce the oven temperature to 325°. Transfer the ribs to a plate and let cool slightly, then skim the fat from the surface of the sauce. Shred the meat into bite-size pieces and discard the bones. Return the meat to the sauce and cook over moderately low heat until heated through. 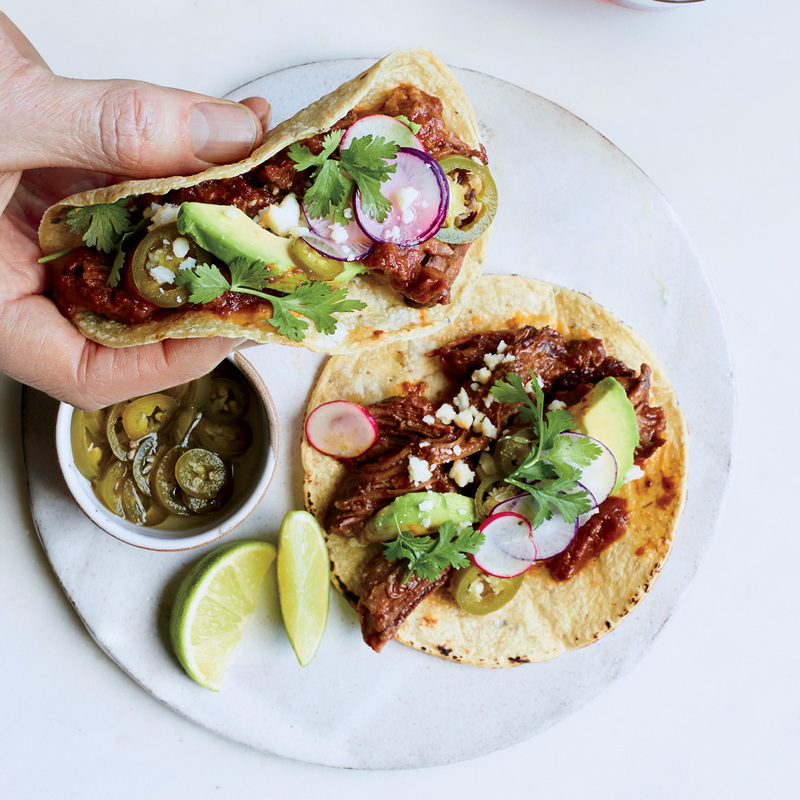 Serve the short ribs in warm corn tortillas and garnish with sliced avocado, radishes, pickled jalapeños, crumbled cheese, cilantro leaves and lime wedges. The short ribs can be refrigerated in their sauce for up to 3 days. Reheat gently before serving. Review Body: absolutely loved this dish! perfect for when the weather turns a little cooler. Review Body: Everything with short rib is a must try!